Many mountaineers like you may have dreamed of standing on the top of Mt Damavand in Iran, a giant 5671 meters volcano, the highest peak of Middle East and the highest volcano of Asia. Now it is the moment to let your dreams come true. 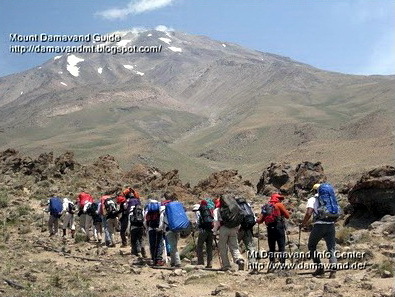 We are experienced Iranian mountain guiding team who are mainly focused on Damavand. and many mountaineering teams and individual climbers use our guiding support each year. We organize two different type of climbing tours to Damawand, Iran. The following are the details for the two different categories. Damavand Economy Tour (also called Group/Shared Tour or Class B Tour) is an economy tour to Damavand Mountain in Iran suitable when money matters. This kind of tours is financially cheaper compared to a private one, this tour is designed not only to reduce the cost of individual climbers, but also to enable them to join a group and meet other mountaineers from other countries and ascend to the Mt Damavand peak in a team work. Visit also Damavand Economy Tour. Unlike the private ones, these tours have some disadvantages too, they are not so flexible in term of itinerary, timing, privacy and so on and you should be fit, enough strong and have a good pace to follow the team and other participants while trekking. The most necessary and required services for the mountaineering is supported in this package. We organize only few economy tours each year in summer, but other than mentioned shared programs, and in case if we have some free time, we may occasionally announce another shared tour for the South route of Mt Damavand if there are at least five requests and participant for a certain time of summer season. Interested parties may keep in touch for the latest news and more information in this regard and let's work together to finalize all arrangements. Private Tour (or Class A Tour), is an exclusive Mt Damavand full package tour when time and privacy matters. The itinerary and timing are flexible and custom design; it supports any number of participants, from a single climber to a big group. In this package we will support you with all the necessary services for the mountain. You can apply for a private tour any time to best suit your schedule. Red more in Damavand VIP Private Tour. We operate regular private tailor-made tours, almost every week in the summer, and we take many foreign groups and individual to the Damavand summit each year. If you would like to have more privacy and flexibility, we highly recommend our private tours for your mountain activity with our excellent services and qualified guides to support you in custom designed categories. If you are interested in a Private Tour, visit Mt Damavand Tour for more details. (Please note, we do not publish our private tours info in our websites or in events calendars). Damavand Wirtschaft Reiseveranstalter. Berg Damawand Iran Gruppe Reiseveranstalter. Klettertouren Iran Berge. Winter Berg- und Skitouren Iran. Demawand Führungen und steigt. Persische Wandern & Trekking und Klettertouren. Iran Berg exklusive Reiseveranstalter. Persien klettern, wandern und Trekking-Touren. Berg Kletterführer. Führungen und steigt. Trekking Tour-Agentur. Iran Kletterreiseveranstalter. Berg-Expedition tousr. Expedition Outdoor-Aktivitäten und Abenteuer-Touren. Demavand Bergführungen. Wandern Outdoor-Tourismus-Aktivität. Kundenspezifische Wanderungen und Bergtouren. Ski- und Snowboard-Touren. Iranische Mountaineering Association Campingplätze. Iran Wandern Trekking-Touren und Sommerexpeditionen. Ecosystem und Bergkletterführer. Skitouren zu Alborz und Zagros-Gebirge. Iran reisen Tour Touristenattraktion Webseiten. Besuchen Iran caltural Attraktion Sightseeing Webseiten. Damavand economy tour organizer. Mount Damawand Iran group tour operator. Climbing tours Iran mountains. Winter ascent and ski touring Iran. Demawand guided tours and ascends. Persian hiking & trekking and climbing tours. Iran mountain exclusive tour organizer. Persia climb, hike & trek tours. Mount climbing guide. Guided tours and ascends. Trekking tour agency. Iran climbing tour organizer. Mount expedition tousr. Expedition outdoor activity and adventure tours. Demavand Mountain guided tours. Hiking outdoor tourism activity. Custom designed hiking and mountaineering tours. Ski and snowboard tours. Iranian Mountaineering Association campsites. Iran hiking trekking tours and summer expeditions. Ecosystem and mountain climbing guide. Ski touring to Alborz and Zagros Mountains. Iran travel tour to tourist attraction sites. Visit Iran caltural attraction sightseeing sites. Damavand organizador de viajes economía. Monte Damawand Irán operador de viaje en grupo. Escalada recorre las montañas de Irán. Ascensión invernal y esquí de travesía Irán. Demawand visitas guiadas y asciende. Senderismo Pérsico y el senderismo y las excursiones de escalada. Irán montaña exclusivo organizador de viaje. Escalar, realizar excursiones y recorridos de trekking Persia. Guía de escalada Monte. Tours y asciende guiadas. Trekking agencia de viajes. Irán escalada gira organizador. Monte tousr expedición. Expedición de actividades y tours de aventura al aire libre. Demavand Montaña visitas guiadas. Senderismo actividad turística al aire libre. Diseño personalizado de senderismo y montañismo excursiones. Esquí y snowboard excursiones. Campings de la Asociación de Montañismo iraníes. Irán caminatas de trekking y expediciones de verano. Ecosistema y guía de escalada de montaña. Esquí de fondo a Alborz y montes Zagros. Irán visita a los sitios de atracción turística de viaje. Elegí un sitio de atracción de turismo Irán caltural. Damavand tournée économie organisateur. Mont Damawand Iran visite de groupe opérateur. Escalade Tours montagnes Iran. Ascension d'hiver et ski de fond Iran. Demawand visites guidées et monte. Randonnée Persique et la randonnée et des excursions d'escalade. Iran montagne organisateur exclusive de tournée. Montée, de randonnée et de trek visites Perse. Mont guide de l'escalade. Visites guidées et monte. Trekking agence de voyage. Iran escalade organisateur de voyages. Mont expédition tousr. Expedition circuits activités et aventure en plein air. Demavand Montagne des visites guidées. Randonnée activité de tourisme de plein air. Spécialement conçu randonnée et l'alpinisme visites. Ski et snowboard visites. Iraniens campings Mountaineering Association. Iran randonnée randonnées et expéditions d'été. Ecosystème et guide de l'alpinisme. Ski de randonnée à Alborz et Monts Zagros. Iran tournée vers des sites d'attraction touristique voyager. Visitez les sites attraction touristiques de l'Iran. Visit also Damavand Tour, Damavand Ski Touring. Damavand Tour economia organizzatore. Mount Damawand Iran tour di gruppo operator. Climbing tour montagne dell'Iran. Invernale e sci alpinismo Iran. Demawand visite guidate e sale. Escursioni a piedi persiano e arrampicate. Iran montagna esclusivo tour operator. Persia scalare, fare escursionismo e trekking tours. Guida arrampicata Mount. Visite guidate e ascende. Trekking agenzia di viaggi. Iran climbing tour operator. Mount spedizione tousr. Expedition attività e Adventure Tours all'aperto. Demavand Mountain visite guidate. Escursionismo attività di turismo all'aria aperta. Progettato trekking e alpinismo tour. Sci e snowboard tour. Iraniani campeggi Associazione alpinismo. Iran escursioni di trekking e spedizioni estive. Ecosystem e guida di alpinismo. Scialpinismo di Alborz e Monti Zagros. Iran tour per siti di attrazione turista. Scegli un sito di attrazione turistiche Iran caltural. Damavand økonomi tur arrangør. Mount Damawand Iran gruppe turoperatør. Klatreturer Iran fjellene. Vinterbestigning og ski touring Iran. Demawand guidede turer og stiger. Persisk fotturer og trekking og klatreturer. Iran fjellet eksklusiv omvisning arrangør. Persia klatre, fottur & Trek Tours. Mount klatrefører. Guidede turer og stiger. Trekking tur byrå. Iran klatring tur arrangør. Mount ekspedisjon tousr. Expedition utendørs aktivitet og opplevelsesturer. Demavand Mountain guidede turer. Fotturer utendørs turisme aktivitet. Spesialdesignet fotturer og fjellklatring turer. Ski og snowboard turer. Iranske Mountaineering Association campingplasser. Iran fotturer trekking turer og sommerekspedisjoner. Økosystem og fjellklatring guide. Skiturer til Alborz og Zagros. Iran reise tur til turistattraksjon nettsteder. Besøk Iran caltural tiltrekning sightseeing nettsteder. More in Damavand Iran, Damavand Trek, Damavand Hike. Damavand экономика тур организатором. Гора Damawand Иран групповой тур оператор. Восхождений Иран горы. Зимнее восхождение и лыжные прогулки Иран. Demawand экскурсии и поднимается. Персидский походы и экскурсии и восхождений. Иран гора эксклюзивный организатор тура. Персия подъем, поход и Trek туры. Гора скалолазание руководство. Экскурсии и поднимается. Поход турфирма. Иран восхождение туристам организатор. Гора экспедиция tousr. Экспедиция активного отдыха и приключенческие туры. Demavand горы экскурсии. Туризм активного отдыха туризма. Специально разработанная Пешие прогулки и альпинизма экскурсии. Горные лыжи и сноуборд туры. Иранские кемпинги Альпинизм Ассоциации. Иран походы пешеходные экскурсии и летние экспедиции. Экосистема и альпинизм руководство. Лыжные прогулки в Эльбрус и Загрос гор. Иран путешествовать тур в туристической достопримечательностью сайтов. Посетите Ирана caltural привлечение экскурсии сайтов. Damavand ekonomika tur organizatorom. Gora Damawand Iran gruppovoy tur operator . Voskhozhdeniy Iran gory. Zimneye voskhozhdeniye i lyzhnyye progulki Iran. Demawand ekskursii i podnimayetsya . Persidskiy pokhody i ekskursii i voskhozhdeniy . Iran gora eksklyuzivnyy organizator tura . Persiya pod"yem, pokhod i Trek tury. Gora skalolazaniye rukovodstvo . Ekskursii i podnimayetsya . Pokhod turfirma . Iran voskhozhdeniye turistam organizator. Gora ekspeditsiya tousr . Ekspeditsiya aktivnogo otdykha i priklyuchencheskiye tury . Demavand gory ekskursii . Turizm aktivnogo otdykha turizma. Spetsial'no razrabotannaya Peshiye progulki i al'pinizma ekskursii. Gornyye lyzhi i snoubord tury. Iranskiye kempingi Al'pinizm Assotsiatsii. Iran pokhody peshekhodnyye ekskursii i letniye ekspeditsii . Ekosistema i al'pinizm rukovodstvo . Lyzhnyye progulki v El'brus i Zagros gor. Iran puteshestvovat' tur v turisticheskoy dostoprimechatel'nost'yu saytov . Posetite Irana caltural privlecheniye ekskursii saytov. All the material on this site is protected by copyright . All Rights Reserved ©Damavand Economy Tour.